The trailer of Baahubali 2 has been trending over social media, ever since its release yesterday (16th March). The trailer is rich, grand and majestic and has already broken many records with its astounding number of views. Now, it has entered the list, which has many prestigious Hollywood films too. 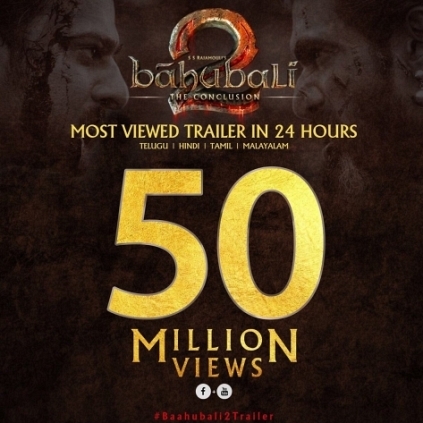 The film has apparently clocked in more than 50 million views (consolidated number of four videos), thereby becoming the world's 13th most viewed online video in first 24 hours. There are many more Hollywood trailers and music videos, which are behind Baahubali 2. It is great to see an Indian film marching ahead of many Hollywood films. Notable Hollywood films like Captain America, Star Wars, Beauty and the Beast, capture the first ten places. People looking for online information on Baahubali 2, S.S. Rajamouli will find this news story useful.